We live in a bioregion that grows conifer trees—lots and lots of them. Christmas tree farms are a big business here—a kind of agricultural product. 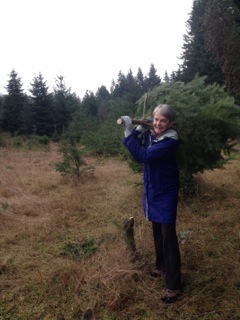 So, it feels completely natural to make the acquisition of our annual Christmas tree an outing to a tree farm. 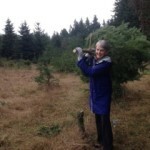 Our local tree farm has been in the same family for three generations—a casual kind of operation that allows you to take a saw and chose your own. There has always been something sacred for me about bringing more light into this season of darkness. Every day from Solstice to Epiphany we begin the day by plugging in the Christmas tree lights and sitting in their glow while the daylight rises. 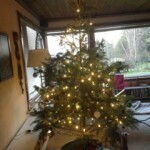 And when Epiphany arrives (January 6), it is time to put the tree outside and give it one more task. 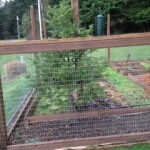 Because we live in the land of eternal winter rains, we move the tree out next to the bird feeder to give the small birds some shelter from the sharp-eyed hawks and neighborhood cats while they munch sunflower seeds and suet. 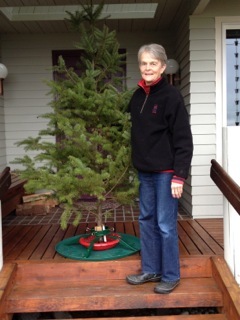 The tree remains green until nearly March, at which time we remove it and cut it up for our outdoor Equinox fire. This simple, seasonal ritual brings so much joy into our hearts. Truly, we love our Christmas tree—and then the birds have an opportunity to love it, too. I love this continuation of ritual and celebration. Someday, when Mama’s reign of control is over, I hope I remember it. 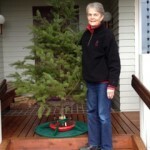 My first Christmas with her, I put the tree on the deck with bird food. Every single day for two weeks, she asked if we were going to miss the Master Gardeners’ recycling; until, in my absence one day, she asked the handyman to take it to the carport so I could dispose of it. I haven’t tried again. Thanks for sharing this wonderfully heartfelt story. For the first time in 20+ years, I too enjoyed a cut tree and just yesterday put it in the backyard so the Tucson birds could experience a conifer. I wanted to share a photo but couldn’t figure out how to do it. I love your deliberateness and thoughtfulness in this ritual. Thank you for sharing! 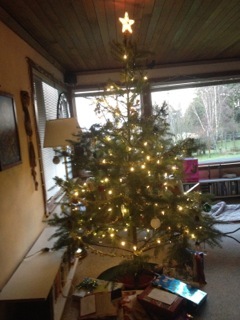 With my Utah kids, our tree is a small, potted Norfolk Pine. We too, turn the lights on each morning and enjoy. 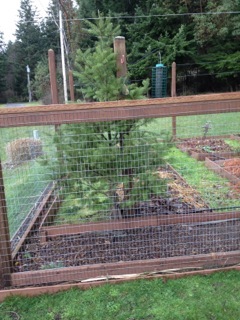 Our little tree will then last 8-9 months (my intent has been for it to last perpetually, but it does not). When dried, we take it outside, and preferably on a full moon, have a gratitude burning. And a rather impressive experience with how fast and high the tree burns!